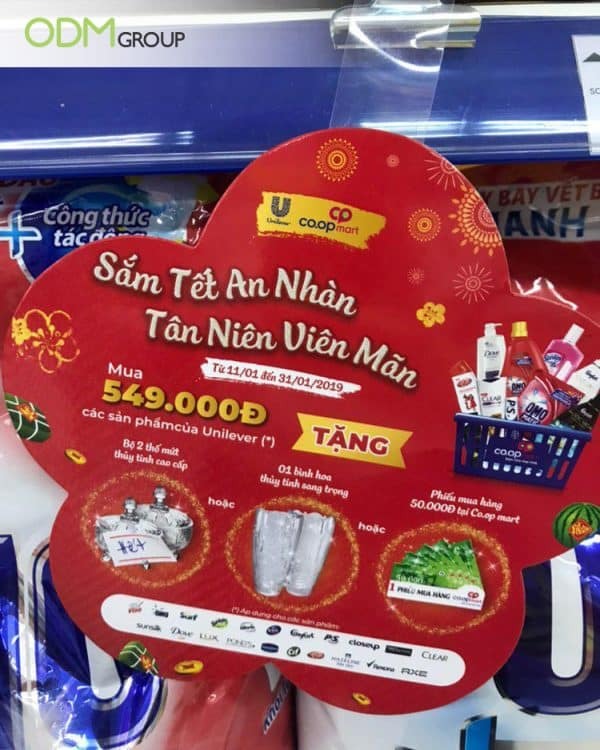 Unilever Vietnam took advantage of the Tet Holidays in Vietnam to increase their sales by offering lunar new year giveaways. 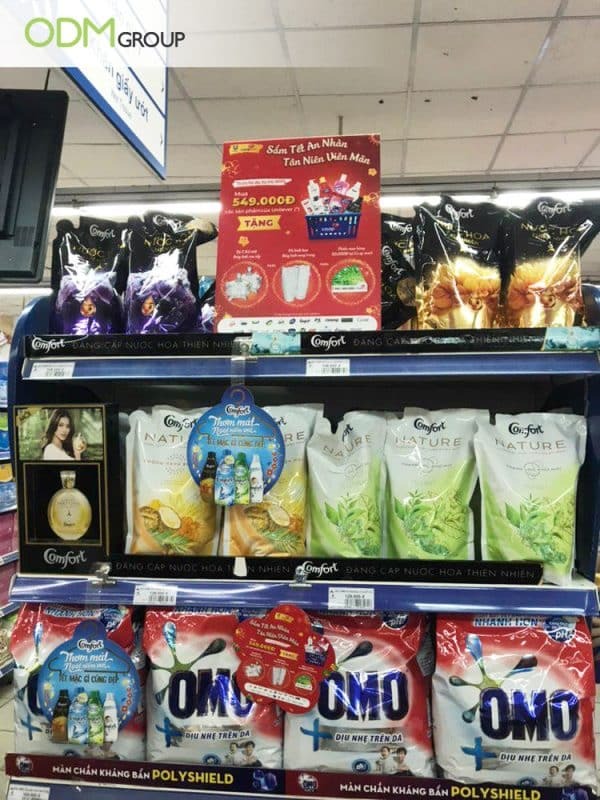 From 11/01 to 31/01/2019, customers who buy Unilever products worth 549,000vnd can get 2 premium jam glass box, 1 premium flower vase or 1 Coopmart gift voucher value 50,000vnd. There were many Unilever products on display, and to increase brand visibility, custom shelf talkers were used. To maximise profits, various marketing tactics have to be implemented so that they can reap the best results for their brands. Why Do We Love These Lunar New Year Giveaways During The Festive Season? Value-Added – During special occasions, it is expected for brands to pull some custom promotional giveaways to beat other competitors. This brings a higher perceived value of product. It makes customers tempted to purchase at first glance. Moreover, the products sold have a long shelf time which gives more reason to purchase. “For a limited time only” – also make the giveaway items even more valuable as they may not be available again. Greater Visibility – The colour red signifies passion and excitement for the upcoming Lunar new year. It is so striking and really hard to miss. With this good deal, word-of-mouth will spread, making the brand appealing to shoppers. If you’re doing a New Year promotions, do consider a POS display stand like what Cadburry here. With the right props and promotional items, a custom POS display will certainly reinforce brand remembrance. Practicality – The contest rewards are practical and suitable for the new year. Customers can put new year goodies into the jam box glasses, flowers in the vase to liven up the mood and voucher marketing can lead to more sales. Promotional Carry Bag – The transparent gift bag that acts as packaging for This is great as it is reusable and also aesthetically pleasing to the eyes. It highlights how their products will make you feel fresh and clean. For the New Year, you can replace the flowers with relevant designs. A promotional carry bag will be ideal for food products and sweets. Unilever’s Promotional Carry Bag Is A Brand Booster – But How? On-pack Gift Promo OR Gift with Purchase Promo – To entice customers, brands must ensure that the in-packed gift or complimentary gift with purchase is relevant and appropriate to their products. It should bring convenience and be of high utility to customers in order for them to highly view products with consideration. While people rejoice at the thought of holidays, brands can take advantage of this season to upsell their products with various marketing campaigns. At ODM, we have wide experience in the industry, specializing in product designing and manufacturing high-quality promotional products, packaging, and POS display units. We can certainly provide you with design services as our dedicated team of product designers at Mindsparkz will certainly help you from product brainstorming all the way to the actual production. Contact us today! Adidas lover? Win their merchandise through a promotional contest instead!